Who are the Billionaires of the World? | Save. Spend. Splurge. Home › Money › Who are the Billionaires of the World? Bloomberg came out with an AMAZING tool that pretty much tracks every billionaire in the world. Ohhh, what a fun toy! I sent it to my spouse nad we are both playing with it. 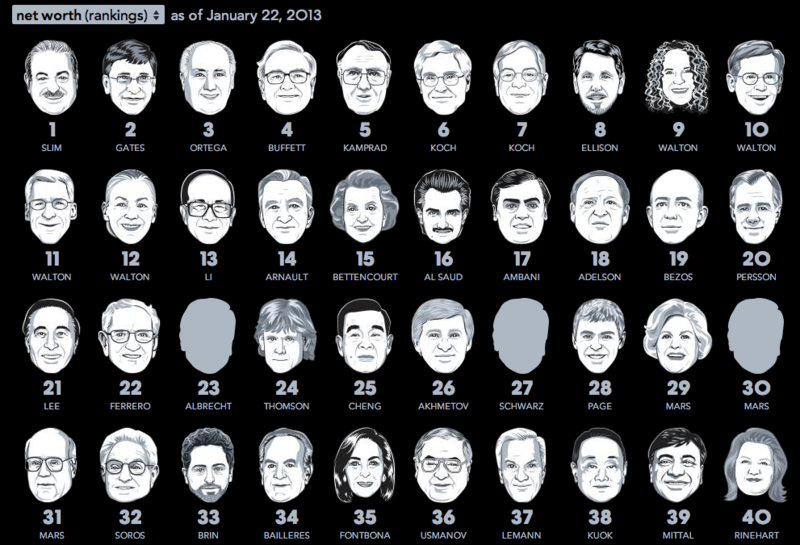 I love that you can read all the profiles of each billionaire. Some of them have interesting tidbits. Great find. That’s a pretty nifty tool :0) I’m embarrassed I don’t even recognize half of the names on that list. Glad to see a mix of men and women though 😀 Maybe one day you or I will become a billionaire too lol, who knows. Don’t feel bad, I didn’t recognize a lot of the names either. Cool tool. I’m going to play around with it a little bit. I don’t recognize half the names either, except the really big ones like Slim, Arnault, Gates, Buffett, Bettencourt, all the Waltons. It’s really cool. I might do a post on them in general.